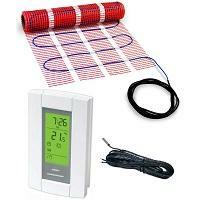 A 70sqft electric underfloor heating mat kit is adequate for a slightly above average 65-70 sq. ft bathroom, kitchen, sauna or any other room with flooring which has good heat conductivity – such as tile. Among compatible types of tile are ceramic, porcelain, natural stone (granite, slate, travertine, etc.) and glass tiles.